Rajasthan at a glance 2015: Rajasthan is filled with colors with the numerous fairs and festivals that are organized here. They are also a reflection of the indomitable spirit of the Rajasthanis who have learnt to enjoy themselves even in the harshest of conditions. The state also glows with its historic past of royalty and magnificence. Known as "a land of courage and gallantry", Rajasthan has always fascinated people from far and wide. The indomitable forts, splendid palaces, amazing sand dunes, tranquil lakes, beautiful temples, exotic wildlife, etc of this state leave you truly mesmerized. Infact, Rajasthan is full of so many contradictions that are even hard to comprehend. 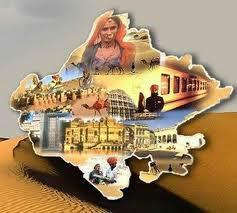 In the following lines, we have provided some quick facts about Rajasthan. Read on to know get quick information on Rajasthan, India. PHYSICAL FEATURES: Rajasthan is the largest state in India. It shares an international boundary with Pakistan in the west. The southern part of the state is about 225km from the Gulf of Kutch and about 400 km from the Arabian Sea. The Aravalli mountain range divides the state into two regions. The north-west region mostly consists of a series of sand dunes and covers twothirds of the state, while the eastern region has large fertile areas. The state includes The Great Indian (Thar) Desert. HISTORICAL BACKGROUND: Rajasthan was a part of several republics including the Mauryan empire, the Malavas, Kushans, Saka satraps, Guptas and Huns. The Rajput clans, primarily the Pratihars, Chalukyas, Parmars and Chauhans, rose to ascendancy from the eighth to the 12th century AD. A part of the region came under Muslim rule around AD 1200, Nagaur and Ajmer being the centres of power. Mughal dominance reached its peak at the time of Emperor Akbar, who created a unified province comprising different princely states. The decline of Mughal power after 1707 was followed by political disintegration and invasions by the Marathas and Pindaris. 1817-18 - almost all the princely states of Rajputana, entered treaties of alliance with the British. 1 November 1956 – Integration ended on 1 November 1956. Full Notes Free Available at "RAJASTHAN GK"